This topic contains 88 replies, has 60 voices, and was last updated by MrsMSC 4 years, 6 months ago. Hi, been doing this now for 5 weeks (although had last half term week off as too difficult not to eat and have the kids around). Lost around 5lb so far. My concern is that the day after a fast I seem to have very little energy, which is annoying as this is when I would normally take a class at the gym, which I love to do. Although, I have been participating in around 4 classes per week for the last 10 months and lost a bit of weight without dieting, now I seem to have stopped at the gym (as I don’t have the energy), I have lost more (and I don’t undertake muscle building classes, only energy burning ones). With regards to sleep, for those who have just started, it will get better, I now sleep as I did before – when I first started I couldn’t sleep at all – was wired!! Good luck to all. Hi a few question, we are doing the Fast. 1.I don’t take coffee on fast days but i like fruit teas would half a spoon of Manuka Honey be acceptable to sweeten? 2.I am Coeliac and require a gluten free diet, whilst I am strict on the diet I find that my intolerance has improved a lot when I experience cross contamination. 3. My cousin has MS would this diet help? Only a beginner…. first fast day last Thursday and I was very pleased the next morning because I had lost over a pound. Sadly I seemed to gain back all I had lost by the end of the weekend. Second fast day yesterday – this morning have lost 1b. I’m slightly worried that if I am going to keep gaining what I’ve lost the diet isn’t going to work for me. Maybe I took the “eat what you like on non fast days” too literally. Comments would be appreciated please. I am 55 year old medical doctor with a similar weight/height profile to Michael Moseley. Three years ago I was diagnosed with colonic Crohns disease. I have been doing the 5:2 diet wih complete fasting 2 days/wk since the TV programme in Aug 12. My BMI has reduced from 26 to 22. My body fat is now 14%. Chol down from 6 to 4. Most importantly of all with medication my Crohns symptoms are now completely under control, which they were not before the 5:2 diet. My memory, speed of thought and mood have also improved. Hi all. Have been on the fast diet since October 2012 and lost about 3/4 stone! I am feeling a bit grim as I have a cold brewing and was wondering if it is still ok to fast when you have a cold? For anyone with medical conditions I’d suggest checking with the medical profession – I wouldn’t take advice from a forum. Personally I wouldn’t fast with even a cold. I also think worrying about weekly weight is a crazy diet habit. Worry about the monthly figures and combine with more exercise if you’re remaining about ideal body fat% (but not until after at least a month of 52). Fast day yesterday. Extra busy day. On the way home around 10,30pm I thought, hang it, I’m having a glass of wine and some toast when I get in. Really enjoyed thinking about it. Got home, made a cup of hot water and it was half an hour later before I remembered my plan, but the need had gone.. WOL working. Hi Nora – ha! The power of being busy, eh? Also, I agree with PaulM; I’d never fast when ill – it just doesn’t feel right. Fasting is for days when you’re feeling strong and focused, not when you’re in bed with Lemsip! Leigh – amazing stats, thanks for sharing them. There’s clearly so much more to know and understand about the power of Intermittent Fasting. Well I decided to fast after all even though I had the remnants of a cold and actually felt loads better the next day. Randomised control test of one! First post since beginning the 5:2 diet on the 2nd January so into the 9 th week. My partner and I began together and have both successfully lost weight. I have lost 22lbs and my partner 13lbs. The reason is probably that she had less weight to lose and is now 2lbs off her target weight of 8.5 stone. 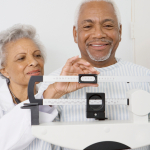 We wish we had tested our cholesterol levels beforehand and checked our BMI too but because we both feel much better we also have a belief that we are in a much better place than we were some weeks ago. Initially we ate porridge with water in the morning and celery with cottage cheese at lunchtime followed by a 300 calorie meal / salad in the evening. After about two weeks we just ate breakfast and an evening meal. We have been disciplined but enjoy the fast days on Mondays and Thursdays which means we have a good feeling about weekend eating. We have become slightly more disciplined on non fasting days but still eat cake or chocolate when we like. Inevitably, when you are losing weight it gives you a motivation to keep it going and we found a bit more from the Hairy bikers diet cookbook that provides nice food between 250 and 500 calories, not for fasting days but for the ones in between. 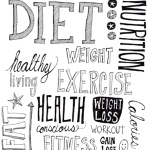 We see this not so much as a diet as a life change. I like the idea of gaining extra brain cells and of my cells repairing themselves and I like the idea of losing internal fat. Fat around the organs. So this is working for us. It is making us feel positive about ourselves and our body image and because I, especially have lost a fair bit of weight there are plenty of positive comments that reinforce the results and make me want to carry on. Neither of us have found it difficult but for those that do I offer them encouragement and ask them to try and forget about food in the timescales that we have become used to. Many people in the world don’t know where their next meal is coming from never mind how many calories are in it. Oh and one last thing. We have used myfitnesspal to track calories and I don’t think you can operate successfully without an accurate guide to calorie intake. Neither of us have become slaves to a diet but we are both enjoying the positive effects of looking and feeling a bit better. Good luck to all of those who are considering starting. Hi everyone can anyone tell me if its ok to do two consecutive days? I tried this the first week and lost 5 pounds. Second week did mon and we’d and have lost nothing! I actually preferred the consecutive days but am not sure if it wll do me any good. Sorry spelling mistake!meant to say did Monday and Wednesday. My dear hubby tells me that the weight loss has made me look a bit older because more hollows and lines appear as the fat below the skin disappears. He isn’t bothered by this but thinks I have probably lost enough for now (hovering a pound or two over my target weight). Having had a body fat %age of 35 and got it down to +-30%, I really would like to get it down a bit more but will take my time over it. It took me 10-15 years to put and keep the extra weight on so I can’t expect it to disappear without a trace. I am actually thrilled to have eye hollows back and think this well worth a few lines. I feel fitter, clothes hang better and I look more like my image of myself, if you know what I mean. Last summer I knew I had to decide between losing weight or sliding into a fat old age, then the Horizon programme…. Can’t thank you enough. Hi, I am in the third week of 5:2. Am losing some weight and feel trimmer, but have suffered the visual disturbances of starting migraines on the day after the 4th and again after the day after the 5th fasting day (today). I quickly have to take a large ibuprofen to keep the migraine from developing fully. Would this be connected to the fasting, or just coincidence? I read some people have had headaches to start with. I am hoping these symptoms disappear as I would dearly like to continue with the 2 fast days a week. Any migraine experiences out there and do they go after some more weeks? Hi Patttyboon. I too am on the fast diet and was a lifelong migraine sufferer until the menapause cured me although I still get occasional headaches. One sure trigger for my migraines was not eating regularly. Are you having only breakfast and dinner? Perhaps if you spread your calories out to have a little something at lunchtime, even just some crudites, perhaps. I have to have something midday otherwise I do feel headachey. Hope this is of help as this seems to be a great way to boost health and lose some weight. I’ve been following the fast diet since the summer, and have lost quite a lot of weight, probably enough. I wonder if I now move to 1 day a week of fasting (6:1)will I still benefit healthwise from the regime? Hi there Dido53, thank you for responding to my migraine questions. Curiously, I hadn’t had a migraine in my life until peri-menopause and now have about three episodes of them a year, always with visual warning signs. I will give your tip of spreading a few calories over the gap between b’fast and dinner a try. In fact, today I had a tangerine for ‘lunch’ on my fast day and I shall see what tomorrow brings. Thanks again. Pattyboon – I’m a migraine sufferer too ( on and off) and was a bit worried about the fast diet triggering them. I’m only on my second week, and today’s my 4th fast day, but so far : no headaches at all. Dinner: 1/2 tin sardines in brine on unbuttered wholemeal toast + 1 ryvita with a teaspoon low fat cottage cheese on it. I find at the moment I sleep better if I have a ‘substantial’ dinner. I drink water and herb tea across the day. I’ve been surprised that the hunger pangs haven’t been too bad so far … Early days yet, but I’m hoping to be slimmer and healthier by summer ( if we get one!). Hi, I need some advice please! I have been trying the intermittent fast diet since the beginning of Aug and although sticking to it strictly have not managed to lose more than 2lbs. I have even tried trying 24hour fasts and a few times have even gone for 36 hours with food. Still to no avail, I find that I would lose a couple of pounds during my fast days but when I am eating on my non fast days (I do not over indulge on those days) I put the weight back on. I have been trying this now for nearly 6 months and am at the point of giving up!! My husband tried it and lost 6kgs within the first two months!! Not sure where to go from here..this week I have tried only eating protein for my fast days (with the exception of some milk in my tea and some vegetables during meal times). Also, I have tried to vary the fast days – either going all day and saving all my calories in the evening or splitting the calories (after going 16hours fasting) for a mid morning snack then having the rest in the evening. Would welcome any advice please. Also, not sure if it makes a difference but I donot have a gall bladder. I have a question about timing the fast (I’m just starting). There’s a big difference between the 2 pm-2 pm method (mentioned in the book)–a 24-hour almost-fast–and almost-fasting from after dinner on Wednesday until breakfast on Friday–closer to a 36-hour almost-fast. 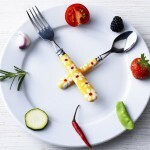 Fasting for a regular day–say, Thursday–is really a 36-hour fast, no? Is this addressed anywhere? Does anyone have advice about this? Thanks to Mimi and Michael for the inspiration and to anyone who can answer! Well, regarding the 2:00–2:00 Plan, I figure the point is both to have fast periods and to reduce calories. I’m having all 600 calories at breakfast, so I have a 16-hour fast, a meal, and an 8-hour fast. Ellie’s system produces a 6-hour fast, a 12-hour fast and a 6-hour fast. (Is a 6-hour fast still a fast?). So the single meal perhaps will produce more fasting benefits, but they both should produce the same calorie/weight loss benefits (unless fasting produces some Atkins-like magic multiplier effect to weight loss beyond calorie reduction). Well, we’ll see. Good luck. Thanks for your input ladave. Your method seems better, although 16 hours is a long time! I am just testing the water here. Unsure what the 2-2 regime is! Any feedback from Michael or Mimi? Hi! Writing from California, USA. 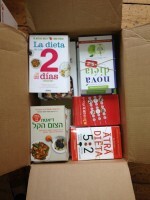 Will the new cookbook be available here as well? LOVING this new way of eating. I’m in menopause and haven’t been able to lose weight in years. I am now! This diet is genius. Thank you. For instance, say my breakfast total was 217 calories, I then had a light salad at lunchtime (mimicking Mimi in the book) which was 153 calories. This left me with 230 calories for my evening meal. Say I decided to have have 100g of boiled potato (79 calories), 50g of cauliflower (18 calories), 50g broccoli (16 calories) and some steamed minced beef. The problem is how much minced beef can I have to keep me within my 600 calorie maximum for the day? Hi all, well this week was better! I did Monday and Friday and lost 2pounds really pleased so have lost7 pounds in three weeks. I even had a hot cross bun and did not feel guilty it’s my feast day after all !! Love this diet good luck to everyone can’t wait for the recipe book to come on the shelves. Hi, I love this way of eating. I’ve always been wary of fasting in the past but I was interested in the effect on brain function. I have had fibromyalgia for some years. I was overweight when I was diagnosed but quickly piled on a further 3 stones despite developing a gluten intolerance. I lost 1stone with a struggle and then developed pre-diabetes. My GPs advice was to give up sugar! I started to monitor my blood glucose and followed the eating plan recommended by the NHS. My fasting glucose continued to creep into the diabetic range so I gave up on the NHS and went low carb. That sorted the glucose and my levels are now normal. I lost a further 2 stones but have been stuck for months. A friend drew my attention to the Horizon program so I got the book and gave it a shot. My weight is dropping better than ever and I am able to eat a few more carbs (50gr). My BG remains normal. The worst thing to me about having fibromyalgia has been loss of cognitive function. I find it frustrating and degrading. When I started fasting I used the link in the book to do the test. In just one month I improved by 4% and I will continue to monitor my progress. My energy levels have improved and I have found no adverse effect on my dodgy muscles. Brilliant! Many thanks to Michael and Mimi. I have to say approx, cos not absolutely certain how many calories in the salad mix but about right. As I write this on 23rd. March 2013 Britain is engulfed by Arctic weather, we have the coldest March weekend for 50 years! So, I thought some fellow fasters might like a recipe for a warming winter soup that won’t break the calorie bank on a fast day! 1) Take a 2 1/2 litre heavy based saucepan and heat the olive oil gently (do not burn otherwise this will produce a free radical, carcinogenic effect). 2) Place the prepared veg in the pan and continue with the gentle heat for about 5 min. 3) Next add the water, herbs (and garlic if using) and bring to the boil. 4) Allow to simmer for 1 1/2 hours in the covered pan. 5) Let the ingredients cool sufficiently and then purée in a food processor and weigh the purée in a suitable container (remember to allow for the container). We are aiming for a total weight of 1.75Kg. If it’s less add boiled water to bring it up to this weight. If it’s more, reduce by further cooking without the lid. 6) After the target weight has been reached, decant the soup in 250ml portions (there should be 7 portions) which can be frozen for future use. 78 calories per 250ml portion. Do try the version with garlic, the flavour is fantastic. Long live the fast dieters! (hopefully we will). I just needed to add that you may wish to season the soup (probably best done at the table). I use freshly ground black pepper and some sea salt. In the original recipe Sarah Brown did not include seasoning because the recipe was intended as a veg stock only. The other point to make is that you may wish to thin the soup slightly, as each portion is quite concentrated. I suggest about 100ml of extra water per portion. This will not affect the calorie content of the portion of course. Hello. I have a question. Does chewing a non sugar gum have any adverse affect on the cellular repair response to fasting. i’m wondering about the chewing itself and the response in the brain and cells. Just browsing this thread- I am usually one of the LOACAS, losing weight EXTREMELY slowly…..but I’m curious- don’t all EU countries use metric weights? Most of these posters read like they are in the UK- but all talking about pounds & stones. Did I miss something?